The year 1935 brought dramatic protests to Vancouver’s streets. Bob Bouchette was there in his role as “everyman,” a witness and a storyteller who saw both sides of the social class divide. Bouchette was an experienced reporter and columnist with a light touch, despite inner demons. Using the tools of his craft — a reporter’s pen, notepad and typewriter — he depicted a young city, its inhabitants and the depression era, with humour, insight and feeling. I write five stories, weaving in the words of Bob Bouchette from articles and columns published in the Vancouver Sun newspaper in 1935. The subjects range from the weather to the bloody Battle at Ballantyne Pier. This montage captures life in Vancouver at a time of economic and social crisis. 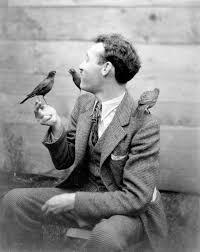 Bob Bouchette at an aviary called the Bird’s Paradise, 1934. This entry was posted on October 18, 2016 at 3:03 am and is filed under BC History Articles. You can follow any responses to this entry through the RSS 2.0 feed. You can leave a response, or trackback from your own site.